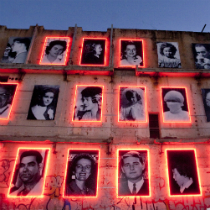 The Wave is a public art space in Valparaiso, Chile. 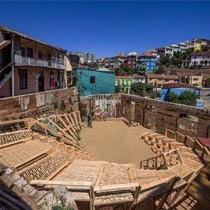 The Scarcity and Creativity Studio from Norway, were commissioned by Sitio Eriazo, the Chilean Arts Collective, to design and build the wave-shaped amphitheatre on an abandoned urban site. 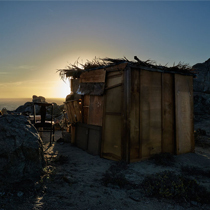 The Homes Project emerged from a 3-month expedition through the vast and expansive coastal landscapes of Chile. 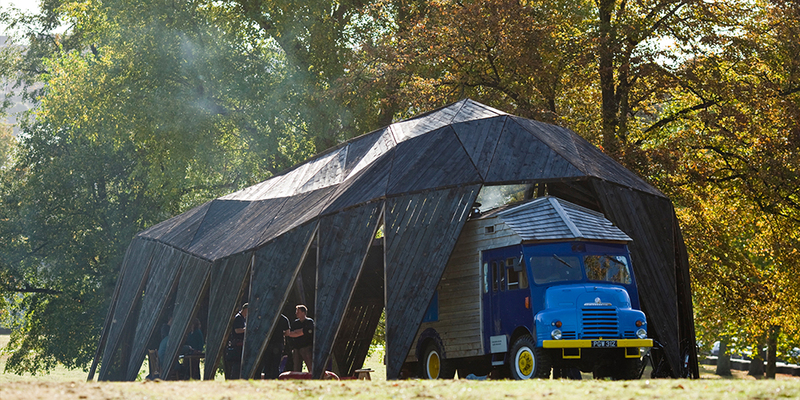 Two British artists utilised found materials to make 6 homes in which they lived throughout their journey. 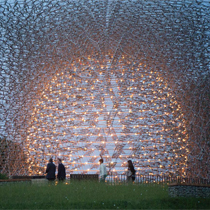 The Hive is an immersive audiovisual installation that integrates experimental architecture and leading edge art-science to create a space for reflecting upon our relationship with a changing environment. 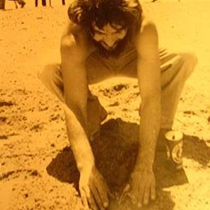 In Wellington, New Zealand in 1978, one hundred and eighty cabbage seedlings in the shape of the word CABBAGE were planted on a long-disused site without permission, challenging a lack of community consultation in decisions relating to the city landscape. Due to public engagement it became known as ‘soapbox art corner’. 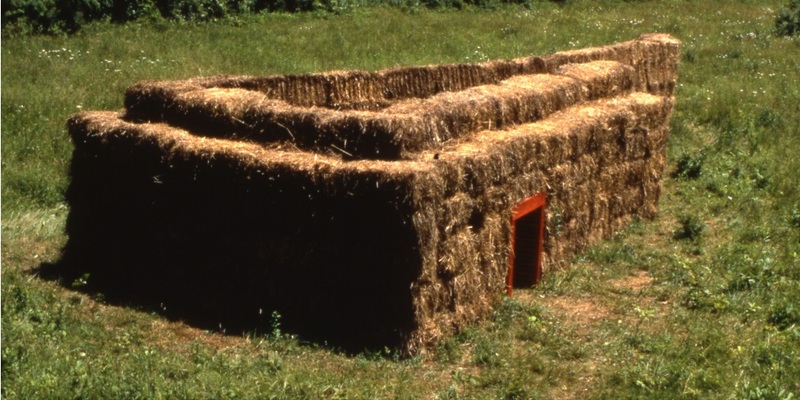 An environmental sculpture set in “the Lot” in the center of New Haven, Connecticut in 2000. 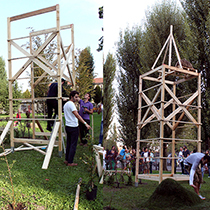 Minimalist in its construction and made entirely of natural materials, the sculpture transformed the rough urban setting by raising one’s awareness of the existing environment and posing an alternative future for the space. 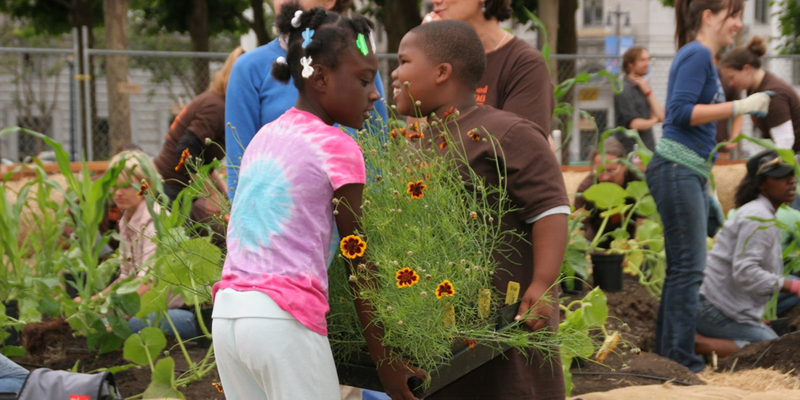 An eco-tourist project exploring local history and community-building in York, Alabama. marksearch crafted town slogans based on residents' stories about the history of the region and their hopes for future. 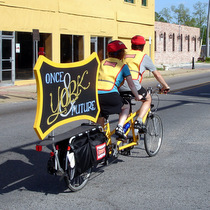 These slogans were displayed on billboards attached to their tandem bike, with which they rode over 200 miles regionally to promote York as an ecotourism gateway. Green My Favela is an environmental remediation project primarily located in the favelas (informal settlements or slum communities) of Rio de Janeiro, Brazil. 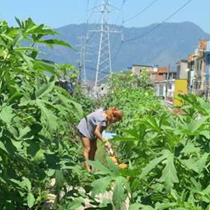 GMF was formed to reclaim degraded land and to create more productive green spaces with favela residents. 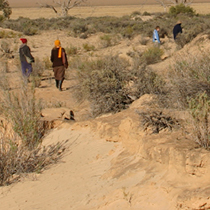 Louise Fowler-Smith, Director of the Imaging the Land International Research Initiative (ILIRI) proposed the idea of retaining rainwater in the walls of a structure for the purpose of recycling and utilizing the water’s thermal mass after witnessing precious water disappear on the occasion of infrequent yet heavy rain at the arid zone research station at Fowlers Gap. A stormwater-mitigation project undertaken at Trinity Episcopal School in Charlotte, North Carolina, USA. It consists of a series of ponds which remediate polluted stormwater run-off and serve as an outdoor laboratory and classroom for the students. The project documents the artist's clandestine process of walking up into the Illawarra escarpment to remove pieces of illegally dumped cars with a battery-powered angle grinder. 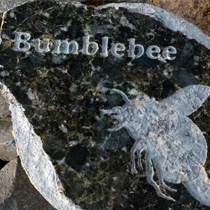 This small act of resistance demonstrates a passionate relation to the impurity of the local environment. 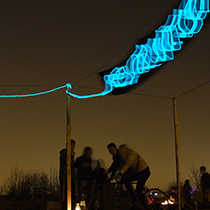 This work consisted of a series of events and projects that resulted from a collaboration between local residents, artists, students, scientists and experts in urban planning. 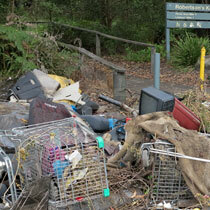 Participants sought to raise awareness about the state of their natural environment using artistic practices. STUDIO for Creative Inquiry, Carnegie Mellon University. 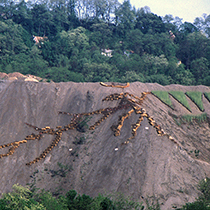 The Nine Mile Run Greenway Project was an artist-led, applied research initiative that engaged the expertise and concerns of citizens, environmentalists, politicians, historians, urban planners, scientists and engineers in a multi-year effort aimed at the transformation of an industrial waste site to a sustainable public green space. 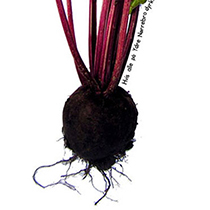 Helsinki Plant Tram is a participatory public art project which incorporates two components; the Urban Plant Tram Action, and the Plant Tram Urban Garden to encourage a network of urban gardens within the city. 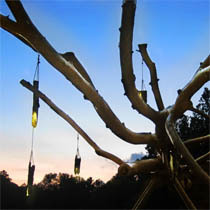 Chop Stick comprises a 100-foot Yellow Poplar (or Tulip) tree suspended horizontally across a small refreshment kiosk that has been entirely constructed from the tree itself. 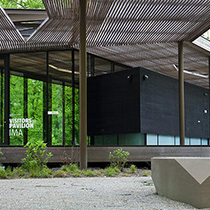 Located within the 100 Acres Art & Nature Park, Indianapolis Museum of Art. 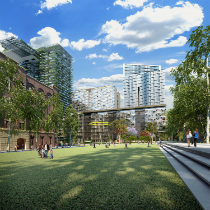 The Central Park Public Art Strategy, developed by Turpin + Crawford, was forged through a partnership between Frasers Property and the City of Sydney, and represents a productive collaboration between the private and public sectors. 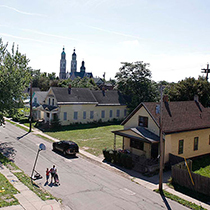 ARTFARMS tackles the post-industrial landscape issue of empty land and urban renewal by connecting artists and farmers in the East Side of Buffalo, New York, to create city-farming solutions. Producing experimental culinary designs—including recipes which incorporate bats, geese, snails, bio-char and water buffalo milk—the New York-based Cross(x)Species Adventure Club is driven to find solutions for improving our natural systems. xClinic Farmacy is a distributed urban farming project that seeks to enhance environmental health and re-imagine food systems. 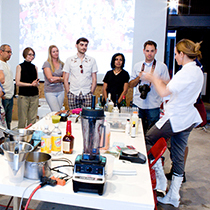 During the summer of 2011 a clinical trial of Farmacy was installed at Postmasters Gallery, New York. 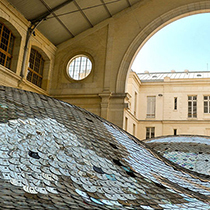 Waste Landscape—comprising of 60,000 unsold and collected CDs which have been hand-sewn together—is a monumental artificial landscape that resembles the ever-increasing mountains of urban landfill at waste management centres. Thunderbolt is a public installation commissioned by the Sydney Olympic Park Authority. 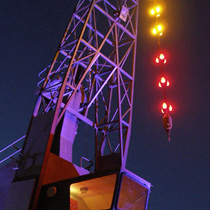 The iron edifice uses a digital interface to respond to real-time measurements of domestic energy loadings in the immediate area by changing the colour of the lights in the sculpture. An organic ‘study retreat’ made from ten cherry trees whose growth will be guided to form a two-storey structure that encloses seats and a table made from plants and grass. 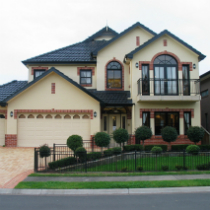 The retreat will reach fruition around 2090. 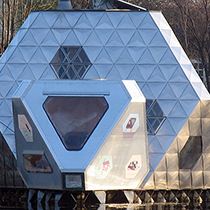 Energy Cafe was a community-based, portable, off-grid kitchen, which explored alternative energy, urban agriculture, and shared public space. Pilot Publishing (Amy Plant and Ella Gibbs) held workshops, talks and open days where visitors could actively participate in creating the work. 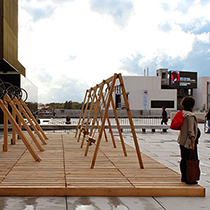 Initially appearing like a normal playground swing-set, Swing, by Moradavaga, is a playful and interactive installation comprising a set of four swings from which participants, by swinging, can create enough energy to power a series of lights built into the platform below the seats. 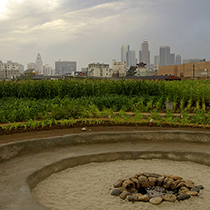 This project involved planting a cornfield on a 32-acre piece of land in the centre of Los Angeles that was stewarded for a full agricultural cycle. 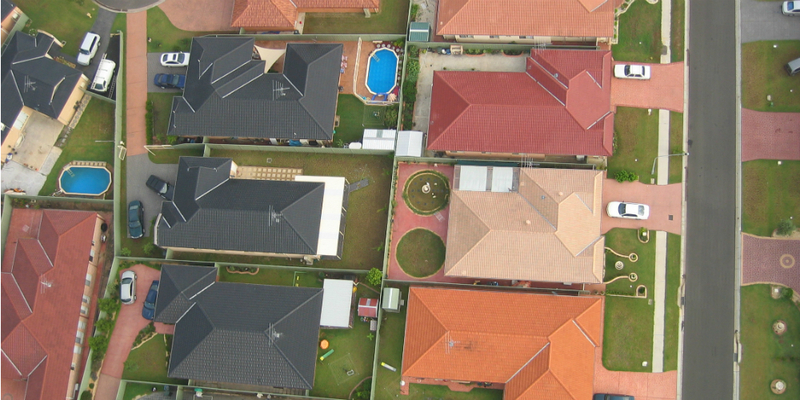 It sought to redeem a plot of once-fertile land depleted by industrialisation. 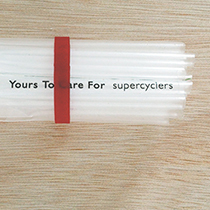 Slow Art Collective worked together with Hiroshi Fuji to create Kaeru, a collaborative community project about waste, renewal and transformation. 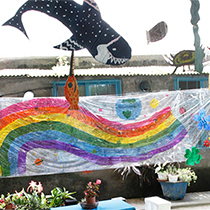 During workshops, visitors were invited to create small objects out of recycled items, which were later brought together to build a garden installation. Camilla Berner, Gillion Grantsaan, Nance Klehm, Marie Markman, Jonas Maria Schul, Åsa Sonjasdotter, Hartmut Stockter and YNKB. 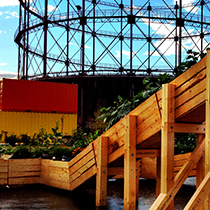 A collection of Danish and international artists explore methods of re-invigorating the city landscape with urban agriculture and gardening. 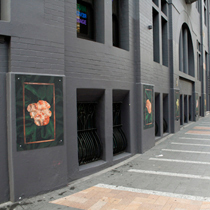 Central to the public art project’s themes is the re-imagining and infiltration of urban space. A kinetic sculpture that is activated by the wind, located in the Central Park development in Sydney. It consists of a large yellow ring which orbits upon an angled mast in response to the variable strength of the wind. An urban fruit orchard located in Del Aire Park, Los Angeles that will be stewarded and harvested by the local community. To bring the project to fruition the artists staged a fruit tree adoption program, a jam-cooking event (‘fruit jam’) and a tree-planting day. 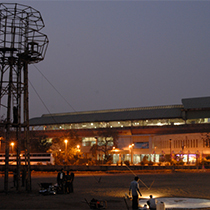 The first public art festival in India, 48˚C Public. Art. Ecology interrogated the diverse ecology of Delhi. The local and international artists featured in the exhibition responded directly to environmental concerns present in the city. A large park dedicated to public art attached to the Indianapolis Museum of Art. Ecological concerns are central to the curatorial and general management of the Park, in which 10 semi-permanent site-responsive works have been installed since the opening in June 2010. 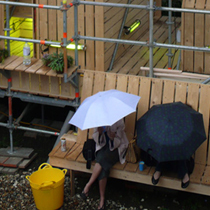 An abandoned site in Southwark was transformed into a temporary lido, equipped with a public outdoor paddling pool, sauna, sun deck, beach huts and bar. EXYZT wanted to foster conversations about how communities can develop through collective memory and shared experiences. 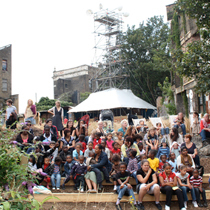 A disused railway line and waste ground in the East London suburb of Dalston was transformed into a temporary 16 metre high fully functioning flour mill with a community kitchen and bread oven that was open to the public. 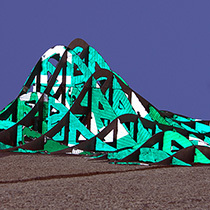 Greenmeme’s Hyperion-Son of Uranus, which is fashioned from recycled street signs collected from the California Department of Transportation (Caltrans), visualises the sewerage infrastructure of Los Angeles County, creating a unique topography of the City’s wastewater data. HeHe (Helen Evans & Heiko Hansen). 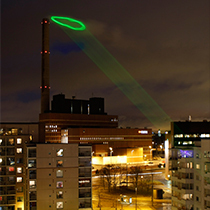 Produced in collaboration with Helsinki Energy, the public art installation Nuage Vert (meaning ‘Green Cloud’) projected green light onto the vapour cloud emitted from that city’s Salmisaari power plant to visualise the plant’s energy output. Richard Goodwin, Russell Lowe, Adrian McGregor. 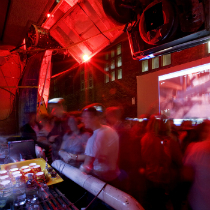 Located at Underwood Street, a laneway near Circular Quay, Seven Metre Bar aimed to convert this usually abandoned site into a bustling social hub while also raising awareness with regard to climate change and rising sea levels. 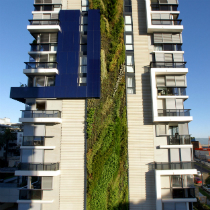 Patrick Blanc’s vertical gardens at One Central Park in Sydney span 1000 square metres and sprawl across the building’s two towers, which are 16 and 33 stories high. At 150 metres high they are the tallest vertical gardens in the world. 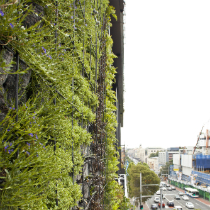 Patrick Blanc’s vertical garden on the northern facade of the Trio North building in Sydney exemplifies the artist-botanist’s longstanding practice of integrating nature into the unused vertical spaces of urban architecture. 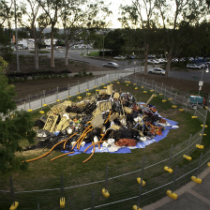 Situated near the Westfield shopping centre in Penrith (Western Sydney), Activate 2750 aimed to address unsustainable modes of consumption and raise awareness with regard to waste management through a confronting and monumental installation of local waste. 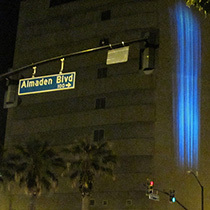 Particle Falls was a temporary public art installation that appeared as a waterfall of blue light cascading down the side of a prominent building in San José. It used laser projection technology to make visible, in real time, the density of air pollutant PM2.5 in the local atmosphere, raising awareness about a significant environmental health concern. Infranatural (Jenna Didier and Oliver Hess). 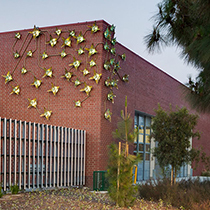 Live Forever, the work of Infranatural (Jenna Didier and Oliver Hess), is a network of custom laser-cut origami-like brass flowers affixed to the exterior wall of a Los Angeles fire station, that by changing in response to humidity and temperature data collected on the station’s rooftop, indicates the current fire-risk in County of Los Angeles. 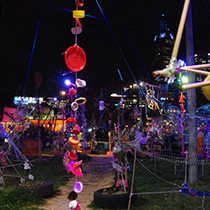 We Make This City was a temporary public art project in the inner-city location of Taylor Square, Sydney, which aimed to encourage agency, change behaviour, and galvanise social and political action in response to Climate Change. 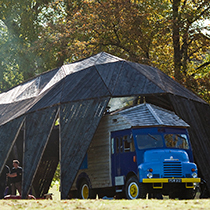 The Black Cloudis an open-air, pavilion-like structure made from panels of charred timber, which acts as a hybrid public sculpture, temporary shelter and venue for social events. This ominous post-apocalyptic construction is a reminder of the impending effects of Climate Change. 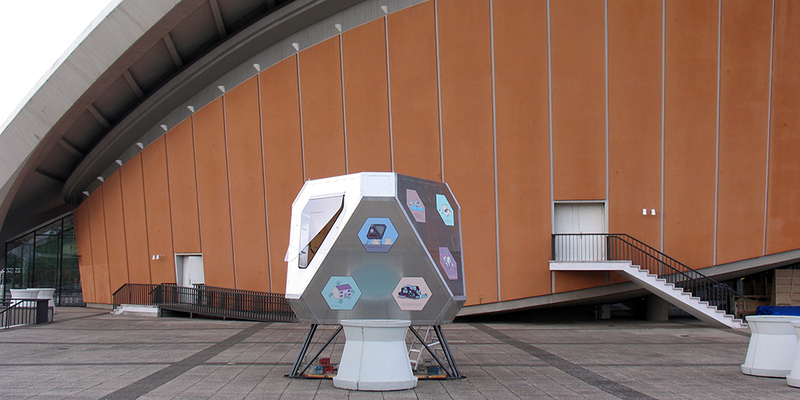 Pod #002, Parasite Heating Unitis a modular dwelling that can be transported and installed in different locations. Representing the relationship between parasite and host, the unit is attached to an existing building, utilising its light intake to heat the dwelling. 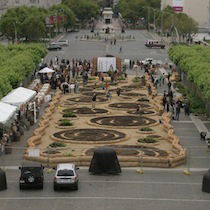 Seeding the City is a grassroots project that incorporates social networking to find methods for greening the city. 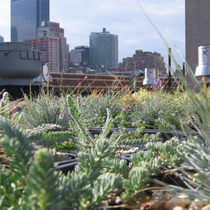 Residents were invited to build compact garden modules on their rooftops to create a large-scale green roof system throughout the city. 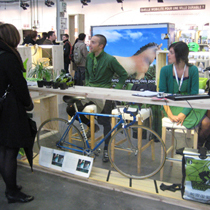 Part of the 2008 Biennial Internationale Design (Cité du Design), City Eco Lab, Saint-Étienne presented 46 projects from the region to visitors in the form of a marketplace. 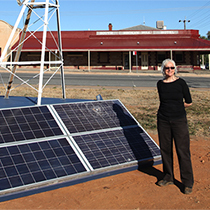 These projects included productive urban gardens, low energy food storage, communal composting solutions, de-motorised courier services and software tools to help people share resources. Elevated above the urban streets of New York City, the High Line is a public park built on an abandoned freight railway line on Manhattan’s West Side. 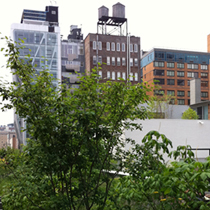 Featuring a constantly changing public art program, High Line Art, the High Line has become a prime example of urban renewal. 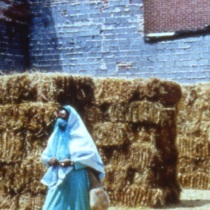 Amy Franceschini from Future Farmers. 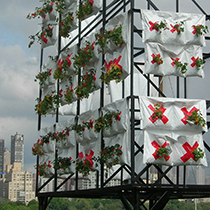 Victory Gardens 2008+ is an extensive program that incorporates art and design with agriculture to transform unused spaces around the city into edible gardens. Weather Cranes transforms two heritage listed industrial cranes into humidity and temperature sensitive instruments. 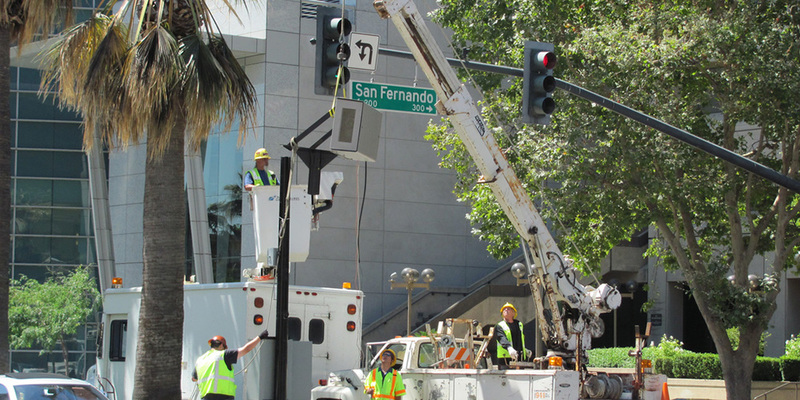 Each crane displays a series of lights attached to the pulley wire, which respond to the changing temperature and relative humidity. At sunset, Earth v Sky continuously samples the colour of the sky. 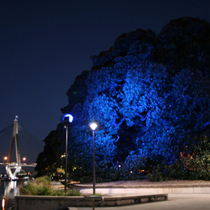 Using this data, nine lights bathe two magnificent Moreton Bay Fig trees in the opposite spectrum of coloured light. 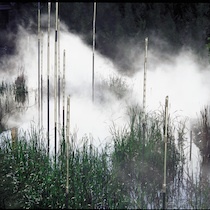 Concerned with the site’s history, In the Shadow by Janet Laurence is an environmental artwork that addresses the remediation of the Homebush Bay area from industrial contamination.